Best looking iPhone and iPad game. Period. 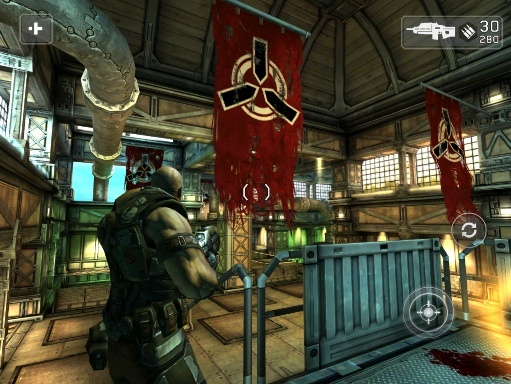 After seeing Shadowgun in action, it's OK to drool. 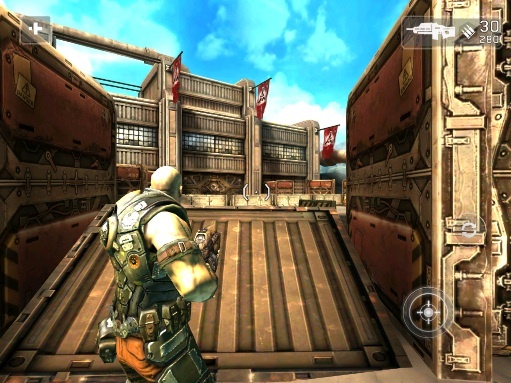 Madfinger Games' thrilling third person shooter plays like Gears of War, and in a surprise twist, bears a striking resemblance to Epic's critically acclaimed trilogy, no small feat, considering it runs on the iPhone and iPad; it's a universal app, by the way. Just about everyone that has downloaded this impressive title raves about the visuals, and for great reason. Everything about Shadowgun screams high quality, from the run down environments dripping with detail to the gun-toting (and lizard like) aliens and hulking robots; the lighting and explosions are equally cool. Thing is, there's more to this gorgeous title than just eye candy. Madfinger seems to think it has a new franchise on its hands, and we're hard pressed to disagree. The game's story (circa 2350) follows the exploits of John Slade, a wise cracking and infamous bounty hunter trying to make ends meet the only way he knows how: tracking down scum for the highest bidder. His latest mission is to find the diabolical Dr. Edgar Simon, even if it means slaughtering the mad scientist's mutant army to get the job done. What ensues is stereotypical but fun banter between Slade and Simon, as well as S.A.R.A., John's android assistant. Quite frankly, we'd love to see additional chapters in this sci-fi universe. It also helps that the combat's thoroughly enjoyable, albeit a bit basic. What we have is a stripped down Gears of War, as Slade guns down enemies, snaps to cover, pops out and takes down a handful of bad guys, including those aforementioned mutants, flying bots and some bosses that take hundreds of bullets to destroy. The developers even tossed a hacking mini-game into the mix that works similar to the classic tabletop game, Simon. There are limitations, of course. While the shooting is top notch, you cannot execute melee attacks, nor does Slade attach to walls; he can crouch and that's about it. In addition, the game crashed a few times, forcing us to restart and trudge through the same areas, including a boss battle. Madfinger needs to iron out the bugs. We're also a bit disappointed with the game's length, which runs a couple of hours, if that. For $7.99, we expected more content. Speaking of more, there's no multiplayer whatsoever, a huge omission, considering the potential. Perhaps an update is on the way. We complain, of course, because Shadowgun is such a wonderful video game, warts and all. All told, it's the current benchmark for iPhone/iPad graphics, and serves as a window into the future. Don't balk at the price. Cough up the dough and give those aliens the business end of Slade's shotgun. Requirements: Compatible with iPhone 3GS, iPhone 4, iPod touch (3rd generation), iPod touch (4th generation), and iPad. Requires iOS 4.2 or later. What's Hot: Phenomenal graphics, satisfying firefights, solid storyline, tough-as-nails hero. What's Not: A bit pricey, limited combat, prone to crash, no multiplayer.